The Norfolk parakeet (Cyanoramphus cookii), also called Tasman parakeet, Norfolk Island green parrot or Norfolk Island red-crowned parakeet, is a species of parrot in the family Psittaculidae. It is endemic to Norfolk Island (located between Australia, New Zealand and New Caledonia in the Tasman Sea). George Robert Gray described the Norfolk parakeet in 1859 as Platycercus Cookii, from a specimen in William Bullock's museum, and recorded it as from New Zealand. The species name honours James Cook, who reported the species on Norfolk Island when he landed there in 1774, noting it was the same as those occurring in New Zealand. In 1862, Gray described a specimen from Norfolk Island as Platycercus rayneri, collected by a Mr Rayner. In 1891, Tommaso Salvadori confirmed the two taxa as synonymous and coming from Norfolk Island. It was long considered a subspecies of the red-fronted parakeet of New Zealand. Ornithologists Alfred North (1893) and Graeme Phipps (1981) noted that the Norfolk parakeet was significantly larger than the red-fronted parakeet. Phipps added that further investigation was needed into their status and conservation. DNA analysis in 2001 showed that it was an early offshoot from the other parakeets in the genus Cyanoramphus, with only the New Caledonian and Chatham parakeet more divergent. "Norfolk parakeet" has been designated the official name by the International Ornithologists' Union (IOC). It is also known as Norfolk Island green parrot, and locally as green parrot. 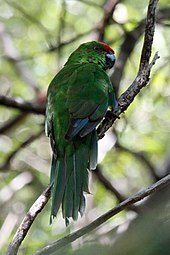 The name "Tasman parakeet" is used by Christidis and Boles on the argument that this species and the Lord Howe red-crowned parakeet (Cyanoramphus novaezelandiae subflavescens) are probably a single species for which they use biogeographical arguments. Tasman is used for other species with the same distribution and they propose that name for that reason. However, the latter subspecies was not included in the genus-wide phylogenetic reconstruction using DNA sequences, and the lumping of the species should be considered tentative. Originally found throughout Norfolk Island(to which it is endemic), it vanished from much of its range until by 1908 it was restricted to forest around Mount Pitt in the northwestern corner of the Island. Its natural habitats are native rainforest, from which it ventures into surrounding plantations and orchards. Seeds make up over half the Norfolk parakeet's diet, particularly in winter. Five species make up 85% of its diet, including the Norfolk pine (Araucaria heterophylla), niau palm (Rhopalostylis baueri), ake ake (Dodonaea viscosa), as well as introduced African olive (Olea europaea subsp. cuspidata) and cherry guava (Psidium cattleyanum). Once a common species, the Norfolk parakeet had dwindled to under 50 birds by the late 1970s. Factors contributing to its decline include habitat loss, particularly of large old trees with suitable hollows for breeding, killing of eggs and young by rats and cats, shooting by early settlers, and competition for nest sites by introduced crimson rosellas and common starlings. In 1983 a captive breeding program was commenced. Although it was not successful, it spark interest in the bird's fate in the people of Norfolk Island. Between 1987 and 2000, a concerted effort to reduce rat and cat populations by trapping, and construction of nesting boxes designed to keep out rats increased parrot numbers, with around 250 young fledged. However, numbers of Norfolk parakeets were difficult to assess and concern was raised between 2009 and 2012 that it might be declining again. A census in 2009 estimated a count of 240 birds. It is only found in Norfolk Island National Park and the surrounding area. Historically it would have been preyed on by the brown goshawk until this species went extinct on the island in about 1790. ^ BirdLife International (2017). "Cyanoramphus cookii". IUCN Red List of Threatened Species. Version 2017.3. International Union for Conservation of Nature. Retrieved 4 February 2018. ^ Australian Biological Resources Study (20 August 2013). "Species Cyanoramphus cookii (G.R. Gray, 1859)". Australian Faunal Directory. Canberra, Australian Capital Territory: Department of the Environment, Water, Heritage and the Arts, Australian Government. Retrieved 28 January 2019. ^ a b Christidis, Les; Boles, Walter (2008). Systematics and taxonomy of Australian Birds. Collingwood, Vic: CSIRO Publishing. p. 157. ISBN 978-0-643-06511-6. ^ Gray, George Robert (1859). "Sect. II: Psittacidae". List of the Specimens of Birds in the Collection of the British Museum. III. London: British Museum. p. 13. ^ Gray, Jeannie; Fraser, Ian (2013). Australian Bird Names: A Complete Guide. Collingwood, Victoria: Csiro Publishing. p. 142. ISBN 978-0-643-10471-6. ^ Gray, George Robert (1862). "A list of the birds of New Zealand and the adjacent islands". Ibis. 4 (15): 214-52 . ^ Salvadori, Tommaso (1891). Catalogue of the Birds in the British Museum. Catalogue of the Psittaci, or Parrots. London: British Museum. pp. 584–85. ^ Phipps, Graeme (1981). "The Kakarikis". Australian Aviculture: 126–39. ^ Boon, W. M.; Kearvell, J. C.; Daugherty, C. H.; Chambers, G. K. (2000). "Molecular systematics of New Zealand Cyanoramphus parakeets: conservation of Orange-fronted and Forbes' Parakeets". Bird Conservation International. 10 (3): 211–239. doi:10.1017/s0959270900000198. ^ Gill, Frank; Donsker, David, eds. (2018). "Parrots & cockatoos". World Bird List Version 8.2. International Ornithologists' Union. Retrieved 2 July 2018. ^ a b c Ortiz-Catedral, Luis; Nias, Raymond; Fitzsimons, James; Vine, Samantha; Christian, Margaret (2018). "Back from the brink–again: the decline and recovery of the Norfolk Island green parrot". In Stephen Garnett; John Woinarski; David Lindenmayer; Peter Latch (eds.). Recovering Australian Threatened Species: A Book of Hope. Csiro Publishing. pp. 105–14. ISBN 978-1-486-30742-5. ^ Higgins, P.J. (1999). Handbook of Australian, New Zealand and Antarctic Birds. Volume 4: Parrots to Dollarbird. Melbourne, Victoria: Oxford University Press. p. 477. ISBN 0-19-553071-3. ^ Waldmann, Amy (2016). Foraging ecology of the world's only population of the critically endangered Tasman parakeet (Cyanoramphus cookii), on Norfolk Island (MSc). Auckland, New Zealand: Massey University.